Rev. Daniel Holstege was led by the Lord to accept the call to serve as a missionary in the Philippines. We give thanks to God for His goodness in providing another missionary, and we look forward to the Holsteges arrival here in the Philippines. Let us remember Rev. Holstege and his wife Leah and their children in prayer as they now make preparations in the coming months to make the move to the Philippines. The dates of his installation as a missionary and of their move to the Philippines have not yet been decided. to preach for us here in Provident for both worship services on Sunday, April 10.
monthly teaching among the Reformed believers and pastors there. The next 7M (pastors’ training classes) is scheduled to meet here in PCC on Tuesday, April 12, the Lord willing. For the latest personal news and pictures on the life and labors of our missionary in this country, visit the Kleyn's blog. 1. 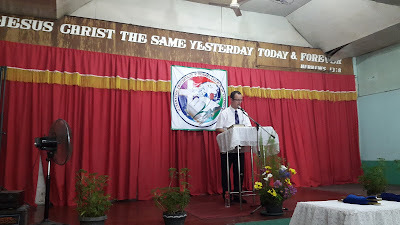 Today Rev.Daniel Holstege (First PRC, Holland, MI) announced that he was led by the Lord to accept the call from Doon PRC to serve as second missionary in the Philippines. We thank God for this provision of a great need, and rejoice with Doon PRC, the FMC, and the Kleyns in God's answer to prayer. At the same time, we pray for the Holland congregation, that they too might see the wisdom of God in this decision. 2. Rev. Aud Spriensma (Byron Center PRC) and his wife Alva, who formerly served in the Philippines (2002-2007) plan to leave this Thursday, March 24, for three weeks of assistance on the field (Sundays of March 27, April 3 and 10). 3. For the latest personal news and pictures on the life and labors of our missionary in this country, visit the Kleyn's blog. 4. Remember in prayer all the needs of this labor - our missionary and his wife, the saints in the various churches of the PRCP, and those who hear the gospel of sovereign grace through the preaching of the Word and through the witness of believers. The following updates may be given regarding PRC mission labors in the Philippines and in the federation of PRCs there. The Doon PRC/FMC delegation of Rev.J. Engelsma and Deacon L.Hoekstra returned home safely this past week after their visit to the fields and churches. For more on their visit, go to this recent blog post by missionary D.Kleyn and his wife Sharon. Below are also a few pictures from that post. Deacon L.Hoekstra giving greetings to Provident Christian Church from Doon PRC and the FMC. Delegation with members of the Berean PRC Consistory. The Classis of the PRCP met Thursday, February 25. The meeting was chaired by Rev. Ibe and was held in the Maranatha PRC in Valenzuela. Most of the work of Classis was routine. The most significant item that Classis treated was the request of Rev. 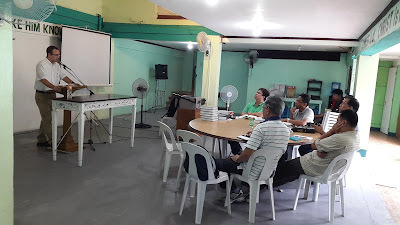 Leovino Trinidad (the pastor of the Maranatha PRC) to be examined by the Classis according to Article 9 of the Church Order with a view to being declared a minister of the Word and Sacraments in the PRCP. The Classis approved his request and scheduled his examination for the next Classis meeting. Classis will hold its next meeting on Monday, June 13, the Lord willing. The congregation of Doon PRC will be voting to call a second missionary to the Philppines on Monday, Feb.29 from a trio consisting of Revs. Brian Huizenga (Hope, Redlands, CA), Dan Holstege (1st, Holland, MI), and C. Griess (Calvary, Hull, IA). The next PRC pastor assigned to visit the Philippine mission field and provide assistance to missionary-pastor D. Kleyn is Rev. A.Spriensma (Byron Center PRC). He is scheduled to be there for the Sundays of March 27, April 3 and 10. Rev. Daniel Holstege and his wife Leah (First PRC, Holland, MI) will be arriving in the Philippines this coming Friday, the Lord willing (Jan.8). Rev. Holstege will be assisting with the PRCA’s mission work. His preaching schedule while he is here will be the Berean PRC on January 10, Maranatha PRC on January 17, and Provident Christian Church on January 24. He will also speak for 7M, as well as during the monthly visit that Rev. Kleyn makes to Bacolod and Southern Negros Occidental. We pray for traveling mercies for Rev. Holstege and his wife, as well as for God's blessings in his labors while on that mission field. This week Friday [Jan.8, 2016] Rev. N.Decker will be traveling with Pete Vander Schaaf to Northern Ireland as a delegation of the Contact Committee. The primary purpose of the visit is to conduct church visitation with the council of our sister congregation, the Covenant PRC of Ballymena and visit the Limerick Reformed Fellowship. Rev. Decker will be gone for two Sundays and be returning on Tuesday, January 19. We also pray for traveling mercies for these men and for God's blessings on their labors on behalf of the denomination. 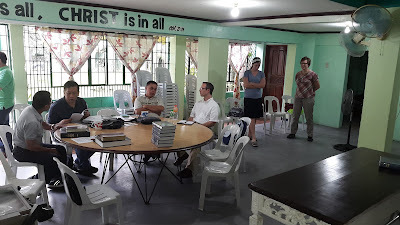 Another of the Philippine congregations the PRC missionaries are working with - dated April 21, 2019. The bulletin of one of the Philippine congregations belonging to the PRC in the Philippines - pastored by Rev. L. Trinidad - Dated April 21, 2019.